Answering your financial aid questions. We know that applying for financial aid can be overwhelming, and confusing for some students and families. We are here to assist you with each step of the process. In order to be eligible and receive a financial aid award that includes Federal grants, student loans, or work-study assistance, you must complete the Free Application for Federal Student Aid (FAFSA). For more information on applying for Federal student aid, go to fafsa.ed.gov. 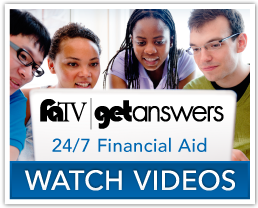 If you need assistance completing the FAFSA application, you can contact us at finaid@uncfsu.edu, call us at 910.672.1325, or review the video playlists below. In order to better serve you, the Office of Scholarships & Financial Aid has partnered with CFI School Services (College Foundation Incorporated) to complete verification for the 2018-2019, and 2019-2020 aid years. If you receive an email or a letter from CFI School Services, verification@SSCwp.org or echosign.com, please respond to CFI School Services immediately. Failure to respond will result in a delay of your financial aid. For questions regarding the verification process or CFI School Services, please go to www.SSCwp.org or call 1-855-328-4400. Financial aid is money (grants, loans, work-study, and scholarships) provided by various agencies (federal, state and local governments, colleges, community organizations, private corporations and individuals) to help students meet the cost of attending college. What is Fayetteville State University's school code? Our Federal, Title IV, school code is 002928. What are the types of financial aid available to me? Grants, such as the Federal Pell Grant, Federal SEOG, and UNC Need Based Grant are free assistance that does not need to be repaid. North Carolina Education Lottery Scholarship is free assistance that does not need to be repaid. Federal Work-Study provides you an opportunity to work and earn money for school. Students work no more than 15 hours per week and are paid every two weeks. Students can apply for an array of scholarship opportunities through the university’s departments, the Office Scholarships & Financial Aid, and external agencies. Contact our Financial Aid office for additional information. Loans, such as the Federal Stafford Loan, are low interest and need to be paid back after you complete school or cease to be enrolled at least half time (6 credit hours for an undergraduate student and 4.5 credit hours for a graduate student). The NC Promise Tuition Plan is a program for three strategically located universities across NC where yearly tuition is $1,000. See how Fayetteville State compares to these costs. You can visit the Office of Scholarships & Financial Aid to learn more about the financial aid process and requirements.